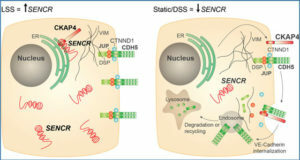 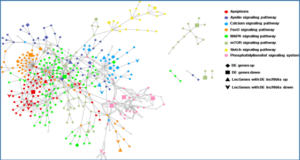 The role of noncoding RNAs in mammalian biology is of great interest, especially since the Encyclopedia of DNA Elements results were published. 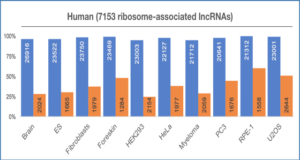 Many have studied microRNAs in the heart, but little is known about their larger cousins, long noncoding RNAs (lncRNAs). 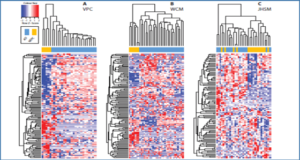 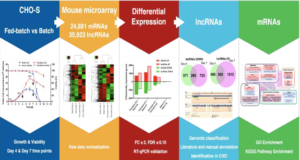 Here, researchers from the Washington University School of Medicine used genome-wide sequencing and improved bioinformatics to quantify lncRNA expression in mouse hearts, define a subset of cardiac-specific lncRNAs, and measure dynamic lncRNA regulation during the transition between embryo and adult, and in the adult heart after experimental pressure overload (a model resembling human hypertensive cardiomyopathy). 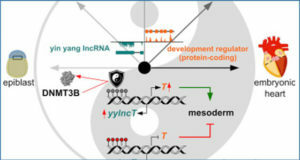 They linked specific regulated lncRNAs to cardiac-expressed mRNAs that they target and, through network analyses, discovered a broader role of regulated cardiac lncRNAs as modulators of key cardiac transcriptional pathways.